If you show or campaign your cat in CFA, there is one tool that is INVALUABLE! The charts are printed in full color with alternating columns of red and black for ease of reading. 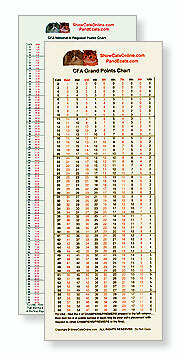 Each chart is fully laminated for quick cleaning and is almost indestructible. Just slip them into your show bag! There is a pale yellow chart for calculating grand points, and a soft white-toned chart for calculating regional and national points. The Grand Points Chart goes up to 124 cats and placements down to 10th Best Champion. Calculate your cats points for each ring. Predict which placement your cat needs to final in order to reach your goal number, a great help in choosing your best show to enter for each weekend. Read the article Using Your Point Charts for more details. These are the "Catillac" of point charts... nothing else compares!